A Hawken graphic novel will flesh out the fiction behind the post-apocalyptic mech combat game. We don't know much about the story behind Hawken, in part because it's not slated to come out until December, but also because things like "story" in free-to-play online mech shooters aren't usually given a whole lot of priority. Giant fighting robots in crumbling, post-industrial hellholes are pretty sweet business in and of themselves, after all, so why waste time and effort cluttering things up with a meaningful plot - particularly when you're a low-budget indie production? But Hawken is something of a unique low-budget indie production and it's already generating an awful lot of pre-release excitement. So the producers have decided to put a bit of narrative meat on the bone by way of a deal with Archaia Entertainment to create a hardcover graphic novel based on the game. The story behind the battle for survival on a collapsing, hyper-industrialized world will be written by Jeremy Barlow, whose credits include numerous Star Wars titles for Dark Horse and, more recently, the script for the videogame crossover comic Mass Effect: Homeworlds. Several artists will also contribute to the project, including Transmetropolitan illustrator Moritat, Stefano Gaudiano of Daredevil and Spider-Man fame, and Khang Le, a co-founder of Hawken studio Adhesive Games whose work can also be seen in Flight. 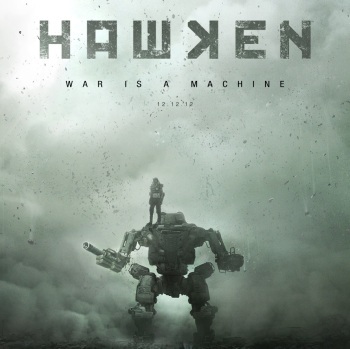 "What excited us most about Hawken was their determination to revitalize, if not redefine, how people see and appreciate mechs," said executive editor and Archaia transmedia producer Joe LeFavi. Citing influences including Blade Runner, Ghost in the Shell and more, he continued, "To find such a gritty and grounded vision of our future was inspiring. Sure, the game is gorgeous and really fun, but Meteor isn't simply creating a great game. They're creating an entire universe fans can enjoy and explore for years to come." The graphic novel will give players a closer look at the world of Hawken and the events and characters that led it to an all-consuming war, but it will also serve a more practical purpose by providing "secret clues and codes that unlock special features in-game." The Hawken graphic novel is slated to come out in March 2013, a few months after Hawken itself, which is scheduled to launch on December 12.